Thank you for making Cave Story for us! Very cool! So... you took some random mod online and posted it here without prior consent? Thank you Nelostic, very cool! 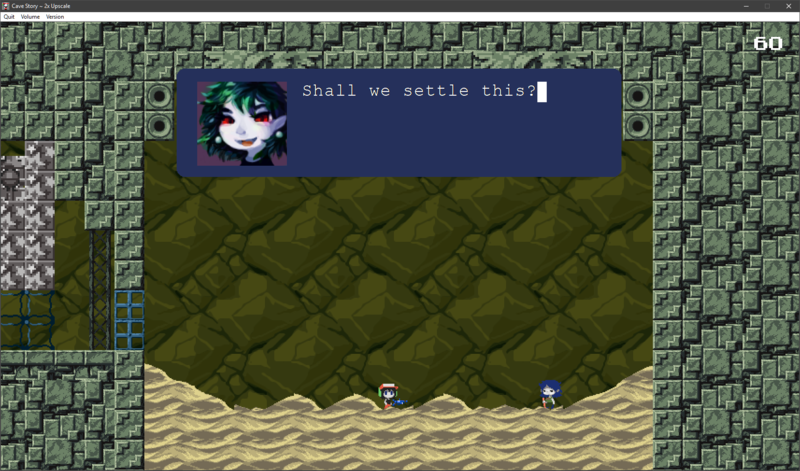 I can't wait to play Worse Cave Story! b. the scaling looks really bad. cs+ looks better. There's a good way and a bad way to have Cave Story in 2x res, this and the Nicalis sprite packaging are both in the bad way category. The reason why we don't get much mods in 2x res because not everyone has the creative talent to make this. Even some of the talented graphic artists here say it's hard to do! You can have free Cave Story 2x by making your own properly, or finding ones that aren't licensed for exclusive commercial use. Not being willing to put a great deal of effort into something like 2x will cause it to be a burden rather than a benefit. If you don't want to 2x Cave Stroy's sprites, you might be best making all of your sprites from scratch, or using 1x. It died a while ago though, as the people working on who were decent enough to get it done quit for other reasons. So how far did it get along in the end? I mean, it was pretty awful, but you can't just write it off. I mean, personally I don't like Haxx's choice of style at all, but regardless it still counts as something. And what about WTF Story and The Show? Those had some okay 2x. I was fine with most of the graphics in the 2x project, what really irked me however was the design choice for the facepics, making them practically unmodifiable in any form.